Spring Cleaning: Preparing the Fish Ladder for Salmon! We're spring cleaning & getting ready for guests--the salmon are coming! The fish ladder at the Chittenden Locks will be closed May 24-June 4 for annual cleaning, inspection and maintenance; the fish viewing gallery will be closed to the public during this time. There actually was a fish ladder constructed in 1917 with the spillway dam; it was very primitive as we didn't know much about salmon migration in those days. 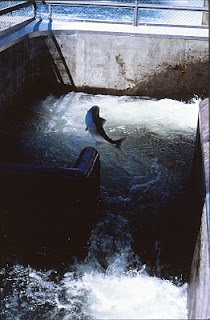 The ladder was not very effective and many salmon moved upstream through the locks and were injured by boats and propellers or by hitting the barnacle-encrusted walls and gates. In 1976 the Corps of Engineers completely rebuilt the ladder, increasing the number of weirs (steps, or waterfalls) from 10 to 21, and increasing the flow of water. 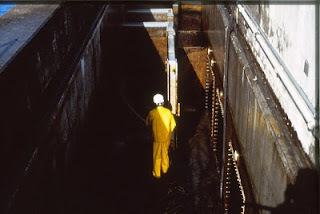 The rush of water out of the base of the ladder attracts the salmon away from the locks, as salmon instinctively know to go against the flow to trace their way back to their natal stream. The smell and taste of their home stream in genetically imprinted while they are young and they follow that unique smell/taste back upstream to spawn. Moving quickly up the waterfalls the salmon jump each step or swim through tunnel-like openings between each weir. Weir 18 of the ladder was elongated to make the fish viewing gallery possible; here the salmon often spend a few hours resting and acclimating to fresh water before continuing their journey upstream. The sockeye salmon is the first salmon species to return to the Lake Washington Ship Canal each year, the early ones usually show up around mid-June and the run normally peaks in early July. The word sockeye is a corruption of "sukkai", the name for the fish used by the Native Peoples of southern British Columbia. Chinook (king) and Coho (silver) salmon runs follow during the summer months. Check back often for more information and updates on the salmon runs at the Chittenden Locks!